5 yards 45 inch wide Halloween fabric in varying patterns I use at least 5 varied patterns; as a guide 30 circles of fabric can be cut from 1-45 inch wide yard. Tip: Generally smaller patterns work better in my view. Adding some metallic fabric catches light and looks sparkly. Glow in the dark patterns are fun too! Cutting out Fabric Circles: Using the cardboard circle guide, cut out the fabric circles (the same number as the numbe of lollipops being used). TIP: You can generally fold the fabric and cut through about 4 layers at once which saves a bit of time over cutting each circle separately. Cutting Pipe cleaners: Cut 12 inch pipe cleaners in thirds, making 4 inch lengths. Wrapping Lollipops: Place the pop in the middle of a fabric circle. Pull fabric tightly around the head of the pop and hold underneath the pop. Twist a pipe cleaner snugly underneath the pop to secure the fabric. Make 1-2 more twists to hold securely. Remove the plastic overwrap from straw wreath being careful NOT to cut the nylon thread that holds the wreath intact (it is see through so doing this in good light will help). Trying to stick lollipops in a new wreath often bends and breaks the sticks. Holding the screwdriver at a 45 degree angle (so the stick of the pop will not protrude through the backside which happens if they are stuck straight in) poke holes into the wreath but not through to the underside (sticks will be concealed within wreath). Leave approximately 4 inches at the top of the wreath without holes which is where the hanger and bow will be. NOTE: You will experience some resistance so be careful to keep hands out of the path of the screwdriver (this is an adult activity)! You can interleave this with the next step of inserting the lollipops so you find the spacing you desire. 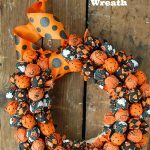 I like the pops snug together so the wreath looks like a mass of Halloween balls. You can also leave space between, and fluff out the bottom of the fabric so they look like little ghosts. Follow the angle of the holes and insert the lollipops to cover the front of the wreath, wrapping in toward the center and out toward the back. None of the straw will be showing from the front with this amount of lollipops. You can add more to completely cover the sides and middle if you choose. Using floral wire, wrap a length around the top of the wreath multiple times and form a hanger from a few strands of the wire on the back. The wreath will be heavy with all the lollipops inserted so this will need to be sturdy. Once you’ve made the hanger, test it by hanging it on the wreath hanger to ensure the wire will stay secure before making the decorative bow. Consider how large a bow you would prefer and how long you would like the tails of the bow. Allowing for at least 1 ½ times that length, cut one-two lengths or ribbon (depending on whether you will make a single or double ribbon bow). Find the middle of the length of ribbon and place that at the back of the hanger. Wrap the ribbon around the wreath on either side of the hanger, allowing ends of ribbon to end in the front. Tie a bow and fluff the ribbon as you choose. NOTE: You can also construct a floral bow and attach it to the front of the wreath if you prefer. Hang it for decoration for the season and then hand the lollipops out for Halloween! The wreath can be reused the following year and until it begins to break down. If reusing wreath again skip step 7 and just insert the lollipops into the holes from the prior year.